Welcome to Part Twenty - the final chapter of The Beginner’s Guide to Freediving, the best place to start your freediving journey. 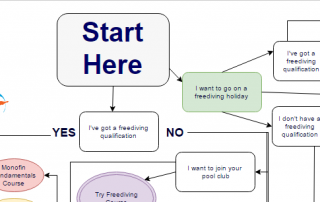 Ever wondered how to turn professional in freediving? 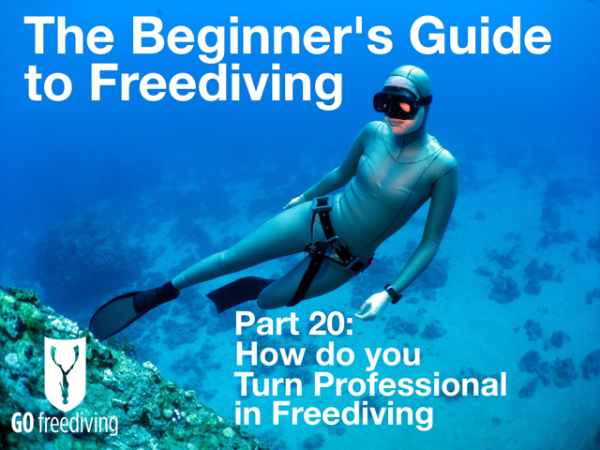 If you’re thinking of going 'pro', this chapter explains how to make freediving into a career. It covers competing as a job, as well as teaching, with the pros and cons of instructing and the different models for instructing, either as an individual or as part of a dive centre. Welcome to Part Eighteen of The Beginner’s Guide to Freediving, the best place to start your freediving journey. If you’re planning to start freediving, this chapter is all about about the monofin. It looks at the history of the monofin, construction and different types. 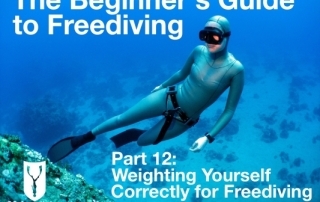 Welcome to Part Seventeen of The Beginner’s Guide to Freediving, the best place to start your freediving journey. If you’re planning to start freediving, this chapter is all about training for recreational freediving. It looks at dry training exercises that you can do at home, including CO2 and O2 tables, fitness training with apnea walking, strength training and yoga, and wet training exercises and games that you can do in a pool. Welcome to Part Fifteen of The Beginner’s Guide to Freediving, the best place to start your freediving journey. If you’re planning to start freediving, this chapter is a must-read for everyone. It focuses on black outs in freediving - explaining what they are, warning signs and symptoms, how to deal with one in your buddy and how to avoid them taking place at all. Welcome to Part Fourteen of The Beginner’s Guide to Freediving, the best place to start your freediving journey. If you’re planning to start freediving, this chapter is about finning techniques for freediving - Why you should look at people walking before you start to fin, how a guide line can help with technique, and how to choose the right fins for you. Welcome to Part Thirteen of The Beginner’s Guide to Freediving, the best place to start your freediving journey. If you’re planning to start freediving, this chapter covers describes how to achieve the perfect duck dive for freediving, why the perfect duck dive is essential and how to do one with minimal effort. Read about each stage and how to put it all together for the perfect duck dive. Welcome to Part Twelve of The Beginner’s Guide to Freediving, the best place to start your freediving journey. If you’re planning to start freediving, this chapter covers weighting yourself correctly for freediving, what sort of weighting we need for different freediving disciplines and water temperatures, plus how to set your point of neutral buoyancy for performance and safety.